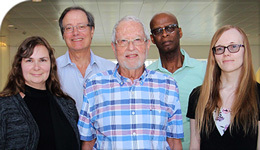 Sociology Professor Emeritus Paul Anisef begins the seventh and final phase of studying the “Class of ’73,” a cohort of baby boomers from Ontario who graduated from Grade 12 in 1973. This unique 46-year study, funded most recently through a SSHRC Insight grant in 2018, follows up with the cohort and continues the longest longitudinal study of late baby boomers in Canada. When complete, the research will deepen knowledge of educational, training, labour market, and aging experiences of Canadians over the past 50 years. The study will also serve to advance knowledge of how life choices are impacted by changes in socio-economic contexts and the active part that individuals play in shaping their own life scripts. The research team will also be able to compare the Class of ’73 with those of similar cohorts in other countries. In addition to Anisef, members of the research team from York University include education Professor Emeritus Paul Axelrod, Faculty of Education Professor Carl James, and sociology doctoral student Erika McDonald. At McMaster University, team members are sociology Professor Karen Robson, post-doctoral sociology student Reana Maier and sociology graduate student Adam Grearson. Team member and Professor Wolfgang Lehmann is based at Western University. “Our research team, consisting of members involved in previous phases and new members who bring fresh expertise and perspective, wish to return to the Class of ’73 as they enter the next stage of their lives and ask them to reflect on their education and work, the achievements of their children and their plans and concerns around retirement,” says Anisef. The original cohort, made up of 2,522 Grade 12 students from 97 Ontario high schools, was first contacted in 1972 by Anisef as part of a short-term study of educational plans. As children, most of the participants lived in two parent families and over half in families with four or more children. Over time, five follow-ups were conducted with the same cohort, with the last follow up (phase six) occurring in winter 1994. At that time, the study participants were 40 to 42 years of age, in mid-life and mid-career, often married and in the process of raising their own children. Over a period of 20 years, the researchers found that middle-class study participants were particularly vulnerable to change, with more than 60 per cent moving up or down the ladder of success with respect to intergenerational mobility. Yet a minority of participants from more humble origins took advantage of economic opportunities and moved into upper socio-economic positions. By the time that study participants were in their mid-20s, two-thirds had obtained at least some post-secondary education. When contacted some 15 years later in 1994-95, over half had returned to pursue further education and more than two-thirds stipulated that they were satisfied with how things had turned out for them with respect to work and career, though an even larger proportion expressed satisfaction with their family and personal life. The cohort is now between 62 and 64 years of age and approaching retirement. Their children are experiencing many of the educational, work and life course pathways previously reported by their parents, although these experiences occur in a distinctly different social and economic context. The team’s approach, similar to that employed in phase six, will combine survey questionnaires and one-on-one interviews to provide a total picture of the cohort’s life course pathways. Much of the first year of the project will be devoted to the challenging task of locating study participants that responded in recent phases of the longitudinal study. These study participants will be asked to complete surveys, either by mail, website or telephone. In addition, some 50 oral interviews will be conducted to provide in depth information about their life course transitions.